Every Wednesday morning during term time a small group of under-threes meets in Woodhouse Eaves Methodist Church for an hour of Toddler Gym. No, not tots in trainers pounding the treadmill, or babes with bulging biceps pumping iron, but small children letting off steam by bouncing on the trampette, crawling through the bendy hide-and-seek tunnels, sliding into the ball pool and generally having fun on lots more of the brightly coloured soft-play equipment. Organiser Audrey Bowers, a qualified child minder with many years of experience working with pre-school children, first identified this niche-need for toddlers in 2010. There's no doubt that older babies enjoy the facilities, too. The first-floor meeting hall is light and spacious and Audrey puts a good deal of thought into creating a safe environment in which young children can develop their imaginations and gain the confidence to go off and explore by themselves. 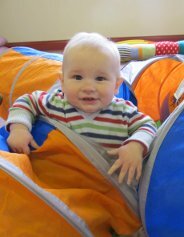 Helen Parker, mother of Thomas is well aware how much her son needs physical indoor play, especially in winter when bad weather keeps him in. Although the emphasis is on imaginative play and exploration, Audrey likes to bring the children and their parents together at the end for five minutes of group action-songs; all good preparation for playgroup when the children turn three. It's not only the children who benefit. For Jolene, fairly new to Woodhouse Eaves, it is also a chance to meet other parents over a cup of tea or coffee. However, not all the children are from the village; those from neighbouring villages are just as welcome. 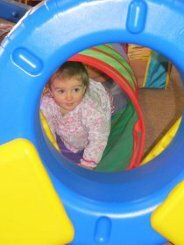 If you are interested in introducing your child to Toddler Gym and would like to know more about it, please call Audrey on (01509) 890 114. Audrey also runs a somewhat different group - Play and Praise - on Thursday mornings. Both groups make a small charge to cover rent, insurance, equipment and out of pocket expenses, but are not profit making. Please note that parents must stay with and supervise their children. If you are looking for a pre-school group to help your child learn, develop independence and give you from one to five free mornings a week, ↪Little Owl Pre-school↪ has an excellent reputation and meets just along the road at the rear of the ↪Baptist Church building↪.